From left to right, Greenspoon Marder founders Michael Marder and Gerald Greenspoon. 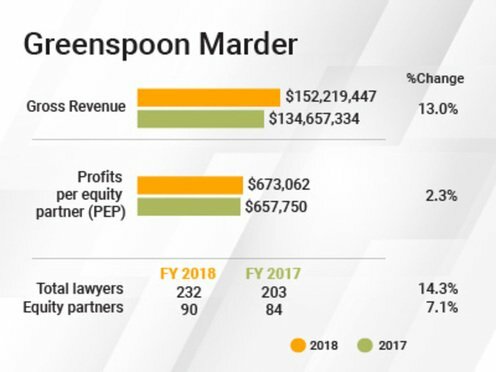 Greenspoon Marder capped off its third straight year of double-digit revenue growth as the firm continues to expand rapidly nationwide. The firm posted a 13 percent increase in gross revenue in 2018, from $134.7 million to $152.2 million. Greenspoon Marder’s head count also grew by double-digits—14 percent—bringing the total lawyer headcount from 203 to 232. “So we’ve continued along the path that we’ve essentially been on,” said Michael Marder, co-founder of Greenspoon Marder. Marder said the firm’s growth strategy last year hinged on geography, as Greenspoon Marder looks to become a truly national firm. To that end, the firm opened a Los Angeles office with six attorneys in April. The office doubled in head count by the end of the year, and Marder said the firm is buying up a second floor of its office building for further expansion. Marder sees a synergy between the medical cannabis market and the health care practice that was a centerpiece of the firm’s early strategy. Last year the firm acquired a federal marijuana lobbying firm, The Liaison Group. An expansion in California is another step toward boosting the practice, which provides less than 3 percent of the firm’s total revenues, according to Marder. Greenspoon Marder also targeted New York, where it added 11 attorneys, and Miami, where it hired four. And so far this year, the firm has added more than 12 additional attorneys. Marder said the lateral strategy will continue to be aggressive this year, though he said he doesn’t have a specific number in mind. “We look at opportunities as they arise. We do expect to be continued growth as we fill out our offices in New York and Los Angeles,” among others, he said. Meanwhile, explosive growth has become the norm for Greenspoon Marder, a firm that had been confined to Florida from its founding in 1981 until relatively recently.